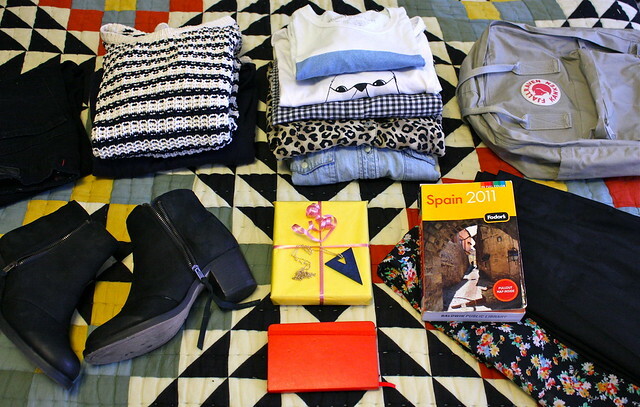 Two days ago I packed my bags and took off for an adventure to Catalonia! It was quite interesting from the start in the airport when my flight was delayed for 5.5 hours. My seat-mate and I made a few friends and we wandered the airport in search of a beer after they finally let us out of the plane to get some food. They wouldn't serve us because someone left their ID on the plane and when we went to get it, they had cancelled our flight and changed the plane over to the other end of the airport. Finally we found a bar near the gate and sat around drinking until we boarded. After that I was dead asleep until I arrived in Barcelona. Wow sounds like you had an adventure even before you left! I hope you're having a wonderful time! Looks like you've done a great job packing! I will use this image the next time I go traveling to remind myself of how to pack properly. Ooh, Spain! I went there when I was 16...I think I would definitely appreciate it a lot more now. I hope you have an amazing time :) How long are you staying? Wait, did you know your seatmate, or did you make friends with them, too? Your clothes look so nice! Aaah, everyone's off on fantastic adventures, going to Paris or Catalonia or Iceland... blah-- sounds perfectly amazing. One day I'll master the skill of making friends with strangers. Perfection! Have fun! Hoist a few and smile a lot. You have no idea, though, the idea of me having the courage to actually speak to strangers makes my stomach twirl and get shot and die. But I am so inspired by this free-thinking, and I am totally going to do this now! I hope you're safe and sound now, I love spain!